It’s a bad sign if Five of Swords card happens to appear during a tarot spread, because it has the most unpredictable and alarming reputation of all the Minor Arcana cards in the deck. Five of Swords indicates emotional imbalance and uneasiness in a soul, which may later develop into a mental illness. If this card happens to appear when practicing divination on a relationship, the Five of Swords indicates betrayal and deceit, treachery by your loved one, or an unpleasant surprise. 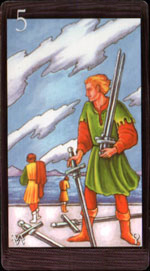 In relation to the Major Arcana, Five of Swords has also a negative meaning, which points to an emotional disharmony and severe internal experiences. The negative meaning of the card cannot be smoothed out, even by positive characteristics of other cards that appeared during the spread. Five of Swords is like a fly in the ointment. If other cards in a spread promise success in business or in relationship, then Five of Swords card is an indication that the joy of the total of all events will be quite small and the result will be obtained with very large losses, which don’t even justify the final outcome. Conquest, challenge and destruction of the environment. A suppression of potential opponents that may rise. Dishonor, risk, loss, disadvantages, failure, rejection, isolation, change of the way of life, demolition of world views. Additional Card Meanings: Fresh Breeze, destruction. Confusion, disorder, oddities, mistakes and miscalculations. Some cards regardless of their position have the same interpretation. Five of Swords is an example of such a card, which in inverted and in upright position means the same sad fact – a triumph of your enemies or anyone who doesn’t like you. In addition, there is sadness and loss ahead of you. Perhaps you’re just not really prepared for the life you chose, and you’re afraid of difficulties. Stop waiting. It’s better to lose in a fair fight, than to surrender without any fight. Don’t get involved in a dubious business or projects. Don’t hope for a rest today. Perhaps you will have to engage into a battle against someone else’s meanness, malice or slander. If this time you’ll be ready to stand up for the truth and until the end, maybe in the future you’ll be spared from such situations.